Just a few posts ago I talked about simple stretches that could possibly bring relief to tight hip flexors and lower back pain. I referred to a yoga pose called the pigeon pose. This pose is where one leg is stretched out to the back and the front of the leg (the front of the thigh, the knee, the shin, and the top of the foot and toes) are on the ground, touching the ground, and the other leg is bent at the knee with foot towards the body, but the shin at a right angle to the body. The hand can hold the foot. The back is long and straight and upright. There are variations. Some are where the leg is bent more and the foot is more pointed toward the opposite hip. In some the back is still long and straight, but the body is lying over the bent leg. In Nia the variation is called a Side Yawn. The leg is bent so the foot is near the opposite hip, as I mentioned above. The arm on the side of the bent leg is bent while the arm on the side of the outstretched leg is straight with palm on the floor. As the body lowers to the earth over the bent leg the outstretched arm moves on the ground reaching out further. Allow the entire body to sink into a comfortable fold. The lengthened side of the body yawns open. For the more athletic version there is more weight on the bent leg and instead of just stretching out over the bent leg there are push-ups involved. Pushing away from the earth and sinking slowly back into it. After a few push-ups then allow your body to release to gravity and lay over the bent leg. This is one of the moves that I mentioned were in the back of The Nia Technique Book. Both the classic version and the athletic version of this move open and release the hips. 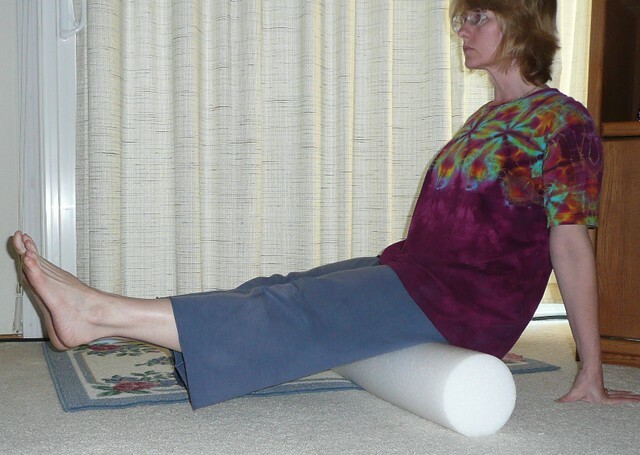 With the classic as you sink to the floor the side of the body is receiving a long stretch. The athletic version enables strengthen of the arms and core. This move is one where you would do as many repetitions as you would like and then switch to the other side. Or you could do one side then switch and do the other side. The point it to be sure that you do both sides. I would bet, as with most of us, one side is more flexible than the other. In the Nia routines I do we are often in the pigeon pose or the side yawn pose, but we do not always sink into the yawn. Often we are dancing with our hands on the floor, not necessarily doing straight up and down push-ups, but using our arms to lower us to the earth and push-off again. As with all moves each individual is invited to do what is best for their body at that moment in the Nia class. So some might sink into the yawn. So usually in addition to stretching our hips we are using our core and our arms in our cool down or floorplay. Do you ever sense your hips are tight and need stretching? Might you think to use this stretch to loosen up?